Why is a deep bite bad for my teeth? A deep bite can be easily corrected these days with one of the many effective orthodontic and restorative treatment options. Malocclusion (or a bad bite) is the result of misalignment of the teeth and jaws, often caused by genetics, but can also be due to teeth crowding, bad, worn or decayed teeth, poor or failing dental work and missing teeth, particularly missing back teeth. Habits such as thumb sucking, lip or nail biting, clenching or grinding teeth can also contribute to the problems. Missing back teeth in an adult can create or exacerbate a ‘deep bite’ leading to collapse of the bite and lower face, giving a more aged appearance. Although it may appear as merely an aesthetic issue a bad bite is in fact far more serious; it can lead to significant damage to the teeth and gums as well as headaches, temporomandibular joint (TMJ) disorder, hearing difficulties and digestive problems – all of which have physical and social implications. Out of all the bite disorders, a deep overbite – when the upper front teeth almost completely overlap the lower front teeth – is the most detrimental to the teeth and health of the jaw joints. It also has an impact on facial aesthetics. Often the lower teeth line or lower dental arch has a ‘bell-shape’, where the lower front teeth rise up much higher than the back teeth and sometimes it is so pronounced that the top edges of the lower teeth actually bite into the gum tissue in the roof of the mouth, potentially stripping the gums from the back of the top teeth. This can be a very serious issue and often leads to loss of the front teeth. Correcting deep bite misalignment will not only improve the functionality of your teeth, but also make brushing and flossing easier – thus helping you to keep your teeth healthy. Of course it also dramatically improves the appearance of your smile too. This often requires a multi-discipline approach with orthodontics and restorative dentistry usually involved. Modern orthodontic treatment is able to correct an improperly aligned bite by intruding your anterior (front) teeth and/or erupting your posterior (back) teeth; many of the options available today are very discreet. 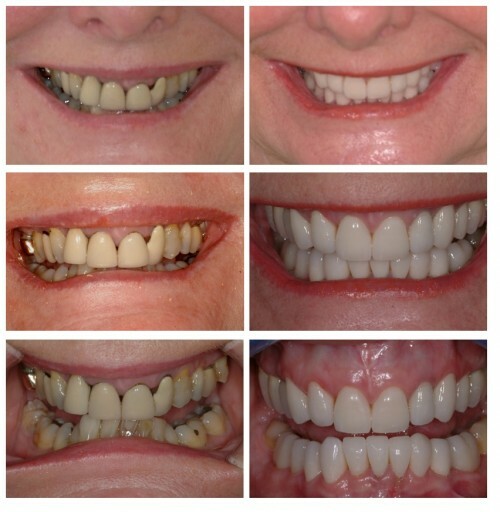 It is common to find the back of the upper teeth and the lower front teeth very worn in ‘deep bite’ cases and treatment often requires restoring the teeth with composite bonding, porcelain veneers or crowns and the use of a ‘Dahl’ appliance (a type of removable orthodontic appliance) is sometimes needed, or alternatively. Sometimes the bite on all the teeth needs to be built up with composite bonding initially followed by porcelain veneers, onlays or crowns. Missing back teeth often creates or worsens a ‘deep bite’ situation and in these cases restoration of the missing teeth with dental implants and/or bridgework is needed to re-establish the correct bite. In severe cases, orthognathic surgery may be the best solution. The choice of treatment will depend on the extent of your deep bite, your facial profile and likely growth, but we will always recommend the least invasive, longest-lasting solution to meet your overall needs. Straight teeth are healthy teeth! Learn more about Why is a deep bite bad for my teeth?